This week is the Games Convention in Leipzig, Germany, so if there's a lot of game news on Gadgetbox, you'll know why. First order of the day: Microsoft announced pricing and availability for the Xbox 360 peripherals that were first mentioned at this year's E3. The Xbox Live Vision video camera (which was recently leaked by an inattentive Toys R Us ) will retail for $39.99 and include a headset, downloads of two Xbox Live Arcade games, and a one month Xbox Live Gold membership. A "Gold Kit" version will include the Camera, headset, three Arcade games, 200 Microsoft Points, and a 12-month Xbox Live Gold Membership for $79.99. Both will be available on September 19. The Xbox 360 Wireless Racing Wheel will come with a limited-eition force feedback version of Project Gotham Racing 3 (while supplies last), and will go for $149.99 in November. 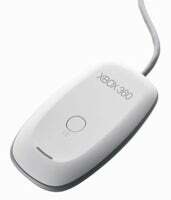 The Xbox 360 Wireless Headset will go for $59.99, also in November. The Xbox 360 Wireless Gaming Receiver for Windows (shown) plugs into a USB 2.0 port on a PC, and allows PC gamers to use wireless Xbox 360 peripherals on their Windows-based computer. $19.99, available in late December. More Xbox 360 Faceplates, which I know you've all been waiting for, will be available in early November for $19.99 each. There are three special-edition faceplates featuring Halo, Viva Piñata, and Forza Motorsport 2. Whew, that's a lot of Xbox 360 news. Hopefully we haven't missed anything, but if we have, well, I'm sure it's out there on the wide Interweb somewhere . Stay tuned for more info from the Leipzig Games Convention.